is one of the world’s leading pizza purveyors, having delivered 76 million pizzas only in the UK and Ireland in 2014. That’s a lot of pizza. In these markets, online sales increased 30% year over year and currently account for almost 70% of all sales; 44% of those online sales were made via mobile devices in 2014 (as opposed to only 31% in 2013). With such a large online presence, Domino’s is always on the cutting edge of technology, enabling customers to order pizzas from virtually any device and platform. To drive success, the team knew they must break down silos, connect data sets, and gain efficient reporting to get a more holistic and actionable view of customer behavior. Domino’s partnered with DBi, a Google Analytics Premium Authorized Reseller, in order to make the most out of their online data. They worked together to create a unified marketing measurement platform, using Google Analytics Premium, Google Tag Manager, and Google BigQuery to integrate digital data sources and CRM data in an effective and scalable way. 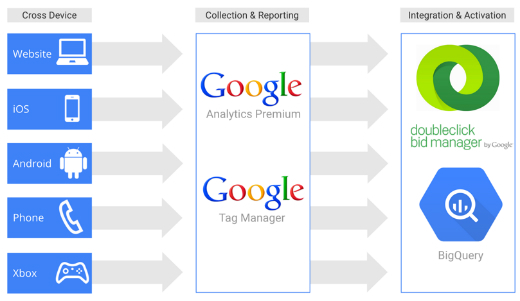 Domino’s deployed Google Tag Manager across apps and websites, setting customized tags for all of the company’s Ecommerce tracking and reporting needs. Despite there being a large number of unique containers, data layer consistency made it easy to duplicate tags and rules - a significant time-saver and error preventor for Domino’s. Domino’s used the BigQuery Export feature in Google Analytics Premium to automatically export raw data to a BigQuery project on a daily basis. They also uploaded daily CRM data into BigQuery through a secured FTP location and the BigQuery API. Following the process described above, CRM data became easily merged with Google Analytics behavioral data via transaction IDs. Below are the main outcomes from the implementations and analyses discussed above. Read the full case study to learn more about how DBi and Domino’s worked together to create a unified data reporting and analysis platform. Domino’s is one of the world’s leading pizza purveyors, having delivered 76 million pizzas only in the UK and Ireland in 2014. That’s a lot of pizza. In these markets, online sales increased 30% year over year and currently account for almost 70% of all sales; 44% of those online sales were made via mobile devices in 2014 (as opposed to only 31% in 2013).